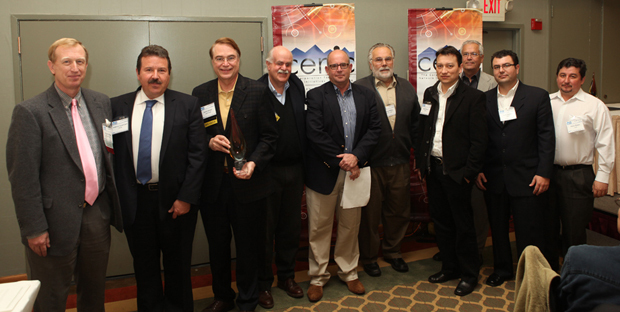 Celebrating the Innovations in Networking Award on March 13 (l-r): Doug Hartline, UCSC; Federico Graef Ziehl, CICESE; Calit2 director Larry Smarr; Carlos Casasús, CUDI; Louis Fox, CENIC; Greg Hidley, Calit2; Raul Rivera, CICESE; Tad Reynales, Calit2; Jose Lozano, CICESE; Hans Reyes, CUDI. A major Mexican-American advanced network project led on the U.S. side by the California Institute for Telecommunications and Information Technology (Calit2) has been honored by the Corporation for Education Network Initiatives in California (CENIC) as a recipient of the 2012 Innovations in Networking Award for High-Performance Research Applications. Partners in the project were cited for the role the networking will play in enabling scientific and educational collaboration across the U.S.-Mexican border. For Calit2, it is the fifth year in a row and the sixth time in seven years that the institute has participated in a project honored with an Innovations in Networking award by CENIC. Given their proximity and the breadth of research taking place at UC San Diego and Mexico’s Centro de Investigación Científica y de Educación Superior de Ensenada (CICESE) in Baja California, network-dependent collaboration between these institutions holds great promise. Highly bandwidth-reliant and data-intensive disciplines ranging from oceanography to disaster response, distributed learning and sharing of rich-media resources among students on both sides of the border, and the development of software tools that support network-based collaboration, are only a few of their specialties. Yet until recently, the lack of high-speed networking between UCSD and CICESE was a serious and demonstrable impediment to Mexico-U.S. collaboration in these and other fields. To address this obstacle to joint research, the UC San Diego division of the California Institute for Telecommunications and Information Technology (Calit2) and CICESE are working with CENIC and its counterpart in Mexico, the Corporación Universitaria para el Desarrollo de Internet (CUDI), to expand available bandwidth linking researchers between the two research hubs. CUDI is responsible for research and education networking in Mexico, and the partnership is supported there by the Consejo Nacional de Ciencia y Tecnología (CONACYT), Mexico’s equivalent to the U.S. National Science Foundation (NSF). CONACYT and partners are funding a 10 Gigabit per second (Gb/s) link between Tijuana and Ensenada (where CICESE is located), and it is also funding last-mile improvements serving not just CICESE but the National Autonomous University of Mexico (UNAM) as well. Improved network bandwidth from UCSD to Tijuana is enabled by NSF funding for 10 Gb/s upgrades to CENIC networking equipment in the Tijuana Bestel POP. As a result, CENIC and CUDI will improve cross-border bandwidth to 10 Gb/s from the current 1 Gb/s, and implement a new 10 Gb/s connection between Tijuana and Ensenada. Ultimately, these improvements will enable new research collaborations between Calit2, UCSD and CICESE, and among other Mexican and U.S. institutions served by CENIC and CUDI. Four Innovations on Networking Awards are given annually by CENIC to highlight exemplary innovations that leverage ultra high-bandwidth networking, particularly where those innovations have the potential to revolutionize the ways in which instruction and research are conducted, or where they further the deployment of broadband in underserved areas. On hand Tuesday, March 14, to accept the award on behalf of Calit2 were institute diector Larry Smarr; Greg Hidley, who has led the collaborative effort with CICESE and other Mexican agencies; and Tad Reynales, Calit2’s information technology manager. The 2012 award represents the latest in a string of five CENIC awards going to projects involving Calit2. In 2011 and 2008, the CineGrid consortium – incubated at Calit2 UC San Diego – received the CENIC award for Experimental/Developmental Applications in high-performance networking. The project showed how advanced networking, telepresence and software tools can dramatically change the way Hollywood studios make movies. In 2010, UC San Diego researchers affiliated with Calit2 shared in two CENIC awards: one for the Scalable, Energy Efficient Datacenters (SEED) project; and the other shared with Australia’s Monash University, with whom Calit2 developed networking and large-scale visualization to support trans-Pacific educational programming between San Diego and Australia. In 2009 Calit2’s GreenLight project won in the same category; the project was cited for exemplary innovations that leverage ultra high-bandwidth optical networking to reduce the carbon footprint of the information technology industry.